This is my second batch of petri dish cookies. 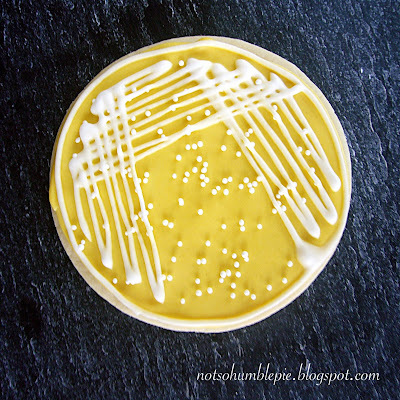 Another odd-ball microbiology science themed cookie that I've made to amuse my husband and his coworkers (thank goodness he isn't a proctologist, eh). I am still not sure if my streaking technique is up to par on cookies, but hey I'm working with royal icing not agar. However, I did improve my counts of isolated colonies by just loading on the nonpareils this time. And unlike the real thing, licking these won't make you horribly ill.
My friend sent me a link to your blog. It's wonderful/hilarious/delicious. And those petri dishes remind me too much of my undergraduate microbiology classes. Gram stain cookies next? Hmmmm, gram stain cookies. That would be fun to try! Or even a gram stained fudge or barfi, cut into neat little 'microscope slides'? Though, explaining to others that the pretty decorative red speckles on the fudge are my artistic interpretation of gonorrhea at 40x might disturb some (okay, disturb just about everyone). Good Lord these cookies remind me of grad school! Thanks for the chuckle! That's fantastic!!! It reminds me of home and work at the same time! My students would love it if I made soem for them! These should be in the front of all biology textbooks. Davin is on a mission to convert everyone to nerdiness, and with the link to your cookies he might get closer. I neither cook nor do math if I can help it. Great post though. Now I have to go to the bakery and find yellow icinged sugar cookies! I'm a big fan of nerds, so I'm happy to help such a mission in any way I can. I think I like these better than the electrophoresis cookies, but they are both great. These are awesome. Majorly awesome. I am gobsmacked and admire your creativity and whimsy. They've certainly put a *big* smile on my face :-). Let's see...maybe Plasmid cookies next? You could dip the round pretzels in chocolate and then pipe different sections in different colors. For one of our bio parties I made pudding petri dishes (wiht real dishes stollen from the stock room! shh) chocolate with white colonies and vanilla with chocolate colonies. I'm sure your cookies tasted better. I would love to see some blue/white selection as a variation on this theme. Perfection! 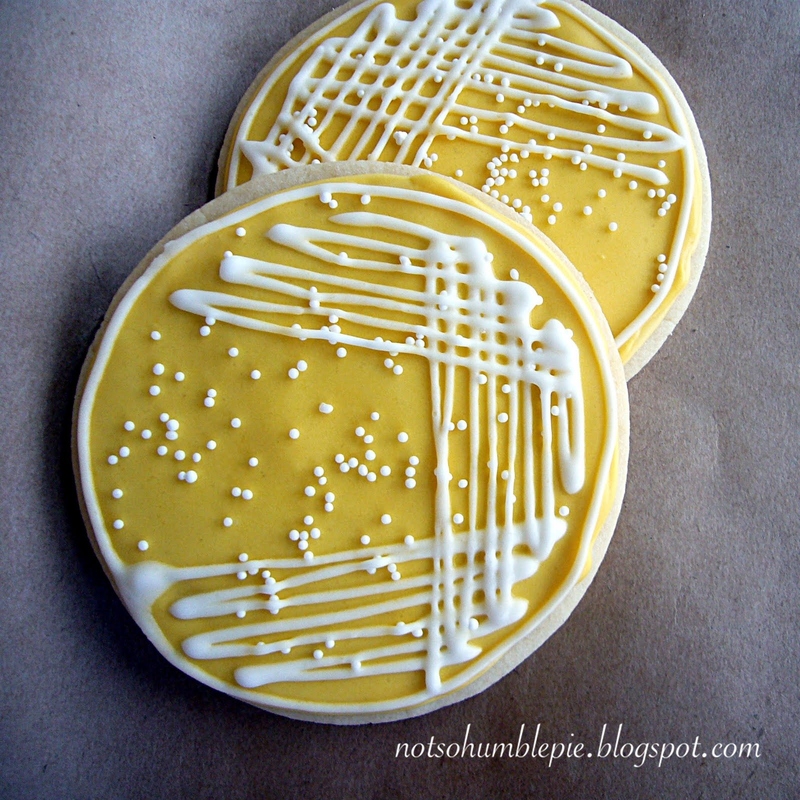 One look at the petri dish cookie and I am transported to 7th grade science class. the only colonies that would grow would be on the paths of the streaking, not the middle of the plate. Great cookie, poor science. I am actually science literate enough to know that. However, when you're making a 100 of these cookies for your husband's lab, you don't apply nonpareils one at a time with with forceps, you just toss them on. People usually don't split hairs over cookies. Usually. Those are awesome! I sent the link to my microbiology instructor buddy and she LOVED them--said they made her snort her morning cereal out of her nose. SUCCESS! Thank you for posting this. I haven't had such a good laugh in a long time. Brilliant! I love all your science-themed cookies (they were the talk of our department lunch hour yesterday). I'm planning on making some for our Holiday party and will certainly send all credit your way if they turn out even half as attractive as yours. BTW, were you and/or your husband at the UW? That's where I got my PhD a few years ago, and I'm thrilled to see such creativity from a fellow Seattle-trained scientist (though I've now moved to another university with Washington in its name about 2000 miles away). Keep up the inspiring work! Yes, my husband and I are both UW alumni. We have very fond memories of our time there. I'm a grad student at UW now and I'm planning on making this tonight for my departments holiday party tomorrow! :) thanks for the great idea! Totally recognizable. Sadly, I only have two friends who would understand them. One works at MIT and the other was my lab partner in microbiology. They'll both be getting a batch for Christmas. For better accuracy, I'd have used three different piping tips: one really big, one medium, and one very thin. Your first loop swab is basically filled with buggies and is very densely populated. Your second swab is still densely populated but not quite as much. Your third go-around is very thinly populated but still streak-y. Your fourth swab has the fully isolated colonies. Wow, they're great! Spookily realistic, and wonderfully nerdy.. Your blog is adorable, and these cookies look fantastic! Hope you have a lovely New Years- I know what I'll be doing on my Christmas Break! Just love your cookies, glade to know there are other nerds out there! every Air Force Ones fancy, elegant Spanish Chantilly MBT Shoes Salelace gowns. best mills in the world. i love love LOVE these! i am making them tonight for my micro class tomorrow! genius! I was browsing over some cookie recipes and I found this. Lovely. I am going to make these for my micro class next week! What a sweet way to celebrate the final exam! Thanks for the great ideas! Jeg elsker elsker elsker disse! Jeg gør dem i aften for min micro klassen i morgen.